Making and receiving video calls with Apple’s truly innovative FaceTime technology is truly simple. No matter how you communicate, it helps sometimes to have a little face time. Apple has engineered a solution that lets you make video calls over Wi-Fi to an iPad 2 or later, iPhone 4, another iPod touch (fourth-generation or later), or a Mac running Mountain Lion or a newer operating system. You can use either the front or back camera with FaceTime — the front camera has just the right field of view and focal length to focus on your face at arm’s length, but you can switch to the back camera to show what’s happening around you. And FaceTime can use the cameras in either portrait or landscape orientation. 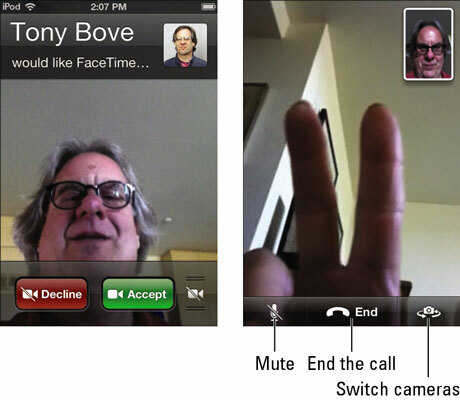 FaceTime calls are not any more intrusive than phone calls — your iPod touch rings (you can sync ringtones to your iPod touch), and an invitation pops up on your screen asking if you want to accept the call. Tap Accept, and the video call begins. To use FaceTime on an iPod touch, you need a fourth-generation or newer iPod touch and to be connected to the Internet over Wi-Fi. The person you’re calling also needs to be connected to the Internet over Wi-Fi or cellular and using a device that can run FaceTime. You also need to sign into FaceTime using the FaceTime app and an Apple ID. Once you’ve signed in, you don’t need to do it again for every call. To sign in, tap the FaceTime icon on the Home screen, tap the Email Address and Password fields to enter your Apple ID and password, and then tap Sign In. If you don’t already have an Apple account, tap Create New Account to set one up. You can then enter your account information on the New Account screen. You can then select an e-mail address that you use on your iPod touch, which is the address that others will use to call you in FaceTime. If you use more than one e-mail address on your iPod touch, you can add the others to FaceTime so that people can use them to call you. Choose Settings→FaceTime, and then tap Add Another Email. Now others can call you using any of the e-mail addresses you provided. While you are in the FaceTime settings screen, you can also set a Reply With Message option to reply automatically when you can’t answer a call (such as “I’ll call you later”). You can also set the e-mail address to use as a caller ID in the Caller ID section of the settings screen. Recents: If you’ve previously had a FaceTime video call with someone, you can make another video call with that person by tapping the Recents icon, and then tapping an entry in the Recents list that appears. Contacts: Tap to see your contacts, which appear just like they do in the Contacts app. You can then choose a contact, scroll the contact information screen to the bottom, and tap the FaceTime button. FaceTime places the call and sends an invitation to the contact. If your contact taps the Accept button in this invitation, you then see the screen with your contact’s face on the other end (or in this case, his fingers, as he hadn’t truly woken up yet). If you are receiving a call, you can tap Decline to decline it, Accept to accept it, or the no-video icon to accept it without a picture (just voice). On the Notifications screen in Settings you can also tap Allow Calls From to specify which FaceTime calls you will accept. While communicating with your contact in FaceTime, a picture-in-picture window shows the image from your iPod touch that the other person sees. You can drag the picture-in-picture window to any corner. You can use FaceTime in portrait or landscape orientation — when you rotate the iPod touch, the image your contact sees changes to match. To avoid unwanted orientation changes as you move the camera around, lock the iPod touch in portrait orientation. To switch from the front camera to the back camera, tap the switch camera button once; tap it again to switch back. You can also tap the mute button to mute your iPod touch microphone so that your contact can’t hear you, although your contact can still see you, and you can still see and hear your contact. To end the video call, tap the End button. Don’t be shy about using another app during a FaceTime call, if you want to. Just press the Home button and choose any app. You can still talk with your contact over FaceTime, but you can’t see each other. To return to the video portion of the call from another app, tap the green bar that appears at the top of the app’s screen. You can turn FaceTime off if you don’t want to receive any calls — choose Settings→FaceTime, and then tap On at the top of the FaceTime settings screen to turn FaceTime off.